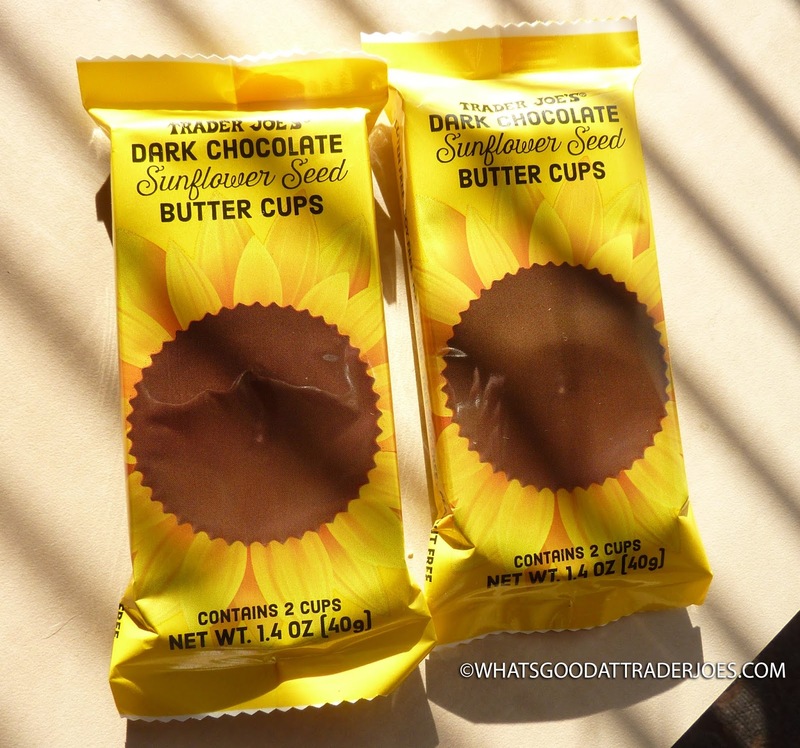 Obviously not a direct imitation of Reese's, these sunny yellow butter cups from Trader Joe's still beg comparison to the king of all chocolate-nut butter combos. Texture-wise, they're nearly identical, but with perhaps slightly firmer chocolate and slightly thinner nut butter. Any discrepancies are negligible. Everybody might've guessed that. And everybody would probably be right. It's the flavor that's so delightfully different—and yet not so different that it tastes like something odd, unfamiliar, or unpleasant in any way. Years ago, we looked at sunflower seed butter just by itself. I was a big fan. Still am, though I can't say we've purchased it regularly since that review. I described that flavor as "mild, slightly earthy, nutty, and smooth" back then, and that description still stands as far as the filling in these cups is concerned. It's also moderately sweet. 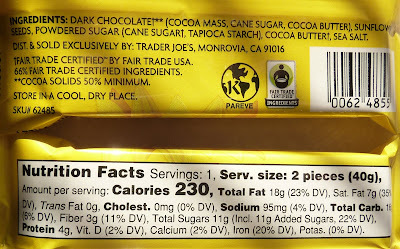 The dark chocolate is pretty typical for Trader Joe's candy-esque fare that we've seen throughout the years. It's rich and full of cocoa flavor and blends pretty well with sunflower seed butter. The overall effect is satisfying and delicious, and there's this vague notion that you're eating something just a little more sophisticated, exotic, and adventurous than a classic Reese's Peanut Butter Cup. If you're thinking these might be a "healthy alternative" to traditional peanut butter cups, I'm not saying you're wrong, since TJ's ingredients seem to lack preservatives and artificial stuff, plus there might be more antioxidants in the chocolate here—but fat and calorie-wise, the numbers are comparable. You're still not eating diet food with these sunflower seed butter cups. And that's perfectly okay, particularly if you're only consuming them in moderation...right? Since peanuts are one of the eight most common food allergens, this product might be a dream come true for those with sensitivities to peanuts. 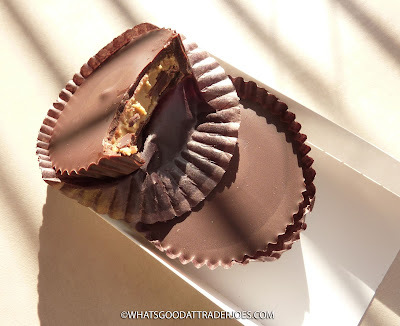 Also see: Justin's Almond Butter Cups. We've tried those from Target, and they're pretty good, but they're usually something like three times the price of this Trader Joe's offering. At 99 cents, it's hard to walk past the checkout stand without considering grabbing a pack or two. I say give 'em a whirl. Four stars a piece from Sonia and me. Doubly good rating from the Pittsburgh WGATJ team as well! Nice. Sounds like you found them at your TJ's then. And they’re VEGAN!! WoooHOooooo! Dairy free! I love sun cups- basically the same thing but expensive and hard to find. My TJs was out of stock last weekend, will definitely look this weekend. Same! Was so happy to see it was dairy-free! 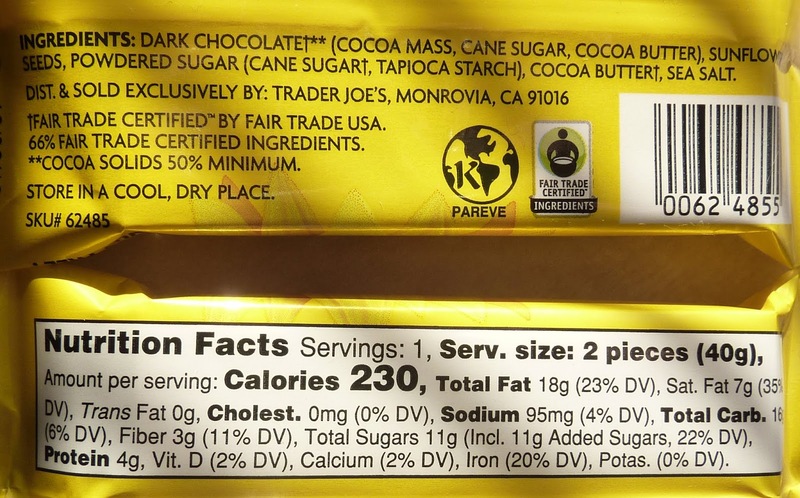 I'm super intolerant to dairy, but was craving chocolate, but even the other TJ dark chocolates that should be dairy-free were made on equipment that have dairy items, and I have to be super careful so I don't even bother when it says that. Seeing these made my day, I grabbed a few the moment I saw them. I think this would make a great lunchbox compartment and send to schools. No worries about peanut allergies.